I never used to care about birthdays, in the days when I bought things for myself all the time, it didn't really matter that I got a few extra things once a year. Now that I don't have so many "me" times, or even the desire to buy things, it's something I look forward to for a while (usually because I can get a babysitter!) though a bad birthday puts me in a terrible mood for months. When I was pregnant a few years ago, I insisted to hubby that I wasn't bothered about presents, since nothing fit me anyway and our house was choccablock with "stuff". On the morning of my birthday, true to instructions, he had got me nothing! I cried for days, I was beside myself. That has never happened since. Anyway, we had some time to ourselves this weekend, and spent a night in a hotel in Leeds, shopping, stopping for coffee or a glass of wine whenever we felt like it, it was a lovely change. Anyway, here are some of the goodies I spotted. First, I had a look in M&S as I wanted to get some Cigarette Pants (this is the actual name of trousers!) I've decided that bootcut trousers looks scruffy and unflattering on me now, so I wanted to get some tapered leg ones. I looked in my usual haunts, but as everyone of mine gets ruined anyway by tiny hands, I wasn't keen on spending £100 on some in my new favourite shops, Hobbs and LK Bennett (more on that later). Anyway, I thought these ones were a cinch at £29.99, Really flattering and slimming too (my new byword, when I buy something now it has to be "slimming"). While I was in M&S, I spotted this cosy jumper. I tried it on and it really suited my colouring, however since getting it home I have realised I will never ever wear it as it is not, you guessed it, slimming! So it's going back, sorry jumper. 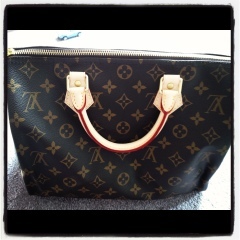 Now I must have been a very good wife this year, as on my birthday I was presented with my very own Louis Vuitton handbag! It is very very lovely, however I am now constantly paranoid wherever I go that everyone is trying to steal it! This is the problem with having expensive things, they end up owning you, don't you think? I have also made a momentous decision about my choice of shops, I am no longer going to shop in Oasis and Warehouse. I am too old, that is a fact. I have decided that I am going to buy less stuff in better quality shops, so I popped into the lovely LK Bennett (yes the fact that my idol K Middy shops there wasn't exactly a bad thing). 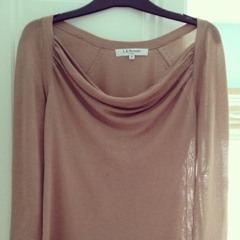 It was very expensive which made me scared, but they did have this lovely cowl neck top left in the sale which was £40. I bought it, it is slimming and goes with everything. I love it. I don't know if it's psychological or not, but it seems like a really good cut and fits me far better than a similar item at Oasis/Warehouse. The annoying thing is though, it's handwash only, does anyone actually ever do that?! I'm all into collars at the moment, to spice up an outfit. I have a Baukjen black dress coming my way soon so I am looking for some accessories to dress it up a bit. I was reading my fav fashion blog Style Guile this morning, and the lovely Beth recommended the great collars in H & M at the moment. Sadly I can't see anything online, but I know they have them, so it might be another trip into Leeds (poor me) to seek some out! I bought a lovely croppped denim jacket in Primark that has lasted really well, worn it loads. White stuff is great post pregnancy as there are a lot of smocks, but now I'm back to "normal" don't see the point in wearing that stuff any more as it's not very smart of chic to be honest. I'm undecided about Karen Millen, seems a bit faddish, not classic? I agree with you, once you get to a certain age you can't get away with the same old things, LK Bennett, Whistles etc do cost more, but if the quality is there, I don't mind paying. I bought 2 LK Bennett jumpers in a sale once and they lasted and lasted. Cost per wear was excellent. As for handwash, I just shove it in the washing machine on 30 degrees - delicate spin and hope for the best. Otherwise things just linger at the bottom of the wash basket and never get worn anyway. My fav shop...difficult one. House of Fraser is good for me, as I like to browse all the concessions, Day Birger Mikkelson is one of my favs and Gerard Darel does some nice bits too. 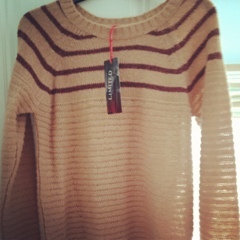 Love All saints for knitwear. Agreed. It's about quality now, thing is when I go shopping I'm always in a blind panic rushing around, which means I always make foolish purchases and then have no time to take stuff back. I need to have done with the cheap sparkly stuff and concentrate on just a few quality items! All Saints is one I haven't tried, good tip thanks!